Iraqi Airways (Baghdad) announced on February 20 that it will begin services to Manchester, UK beginning on March 15, 2015. The twice-weekly service, flown by one of the carrier’s Boeing 737-800s, will include the first flight being between Manchester and Erbil on Wednesdays at 22:00 and the second flight being between Manchester and Sulaymaniyah on Sundays, also departing at 22:00. Erbil is the largest city and capital of the semi-autonoumous Kurdistan region of Iraq. Erbil is located 55 miles east of Mosul. Copyright Photo: Brandon Farris/AirlinersGallery.com. Brand new Boeing 737-8Z YI-ASR (msn 40080) was just handed over to the carrier on February 20. This entry was posted in Iraqi Airways and tagged 40080, 737, 737-800, 737-81Z, BFI, Boeing, Boeing 737, Boeing 737-800, Boeing Field, Erbil, Iraqi Airways, Kurdistan, Manchester, Seattle, YI-ASR on February 26, 2015 by Bruce Drum. Iraqi Airways (Baghdad) has signed a letter of intent (LOI) to acquire five Bombardier CS300 jetliners. 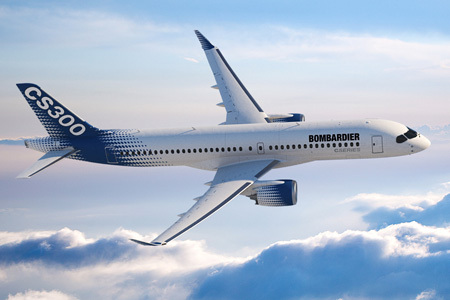 The LOI includes options on 11 CS300 aircraft. Iraqi Airways currently operates six Bombardier CRJ900 regional jets. This entry was posted in Iraqi Airways and tagged Bombardier, Bombardier CS300, CS300, Iraqi Airways on November 19, 2013 by Bruce Drum. 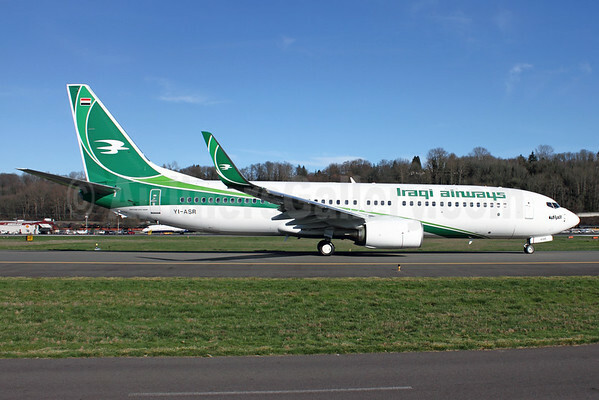 Boeing (Chicago) has delivered a Next-Generation 737-800 to Iraqi Airways (Baghdad), the first of 30 that the airline ordered in 2008, marking a milestone in its relationship with the airline. 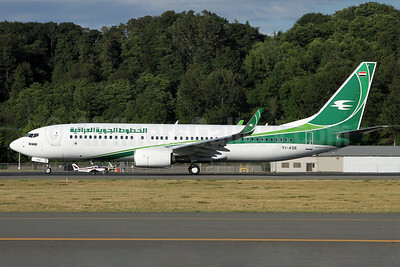 With the delivery of Boeing 737-81Z YI-ASE (msn 40104) on August 12, 2013, Iraqi Airways currently has 39 Boeing airplanes on order, including 29 Next-Generation 737-800s and 10 787 Dreamliners. Copyright Photo: Duncan Kirk/AirlinersGallery.com. Showing off the Arabic titles side, Boeing 737-81Z YI-ASE is pictured on a test flight at Boeing Field in Seattle. The delivery also ushered in a new look for Iraqi. This entry was posted in Iraqi Airways and tagged 40104, 737, 737800, 73781Z, aviation, BFI, Boeing, Boeing 737, Boeing 737800, Boeing Field, Iraqi Airways, King County, Seattle, transportation, YIASE on August 13, 2013 by Bruce Drum. 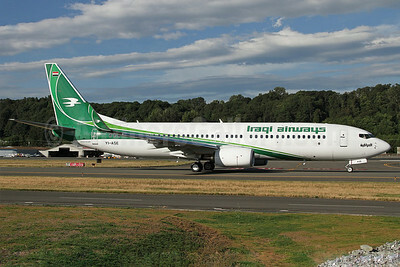 Iraqi Airways (Baghdad) in May 2008, through the Iraqi government, ordered 30 new Boeing 737-800s from The Boeing Company with options for 10 additional aircraft. The first aircraft in the order is being prepared for delivery. The flag carrier is taking the opportunity to also introduce a new livery for the airline. The airline is retaining its historic green and while color scheme but now with updated lines. Copyright Photo: Duncan Kirk/AirlinersGallery.com. Boeing 737-81Z YI-ASE (msn 40104) taxies to the runway at Boeing Field (King County) in Seattle yesterday (May 28) in the evening for a test flight. This entry was posted in Iraqi Airways and tagged 40104, 737, 737800, 73781Z, BFI, Boeing, Boeing 737, Boeing 737800, boeing company, Boeing Field, Iraqi Airways, King County, livery, Seattle, YIASE on June 29, 2013 by Bruce Drum. 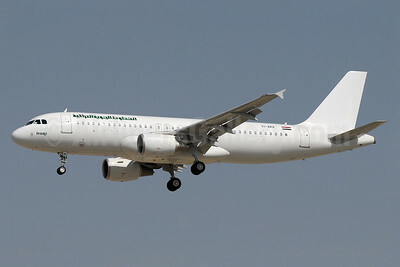 Iraqi Airways (Baghdad) on January 15, 2013 added its first two Airbus A320s. The pictured A320-214 YI-ARA (msn 5115) and YI-ARB (msn 5290) have joined the mainly Boeing fleet. Copyright Photo: Paul Denton. A320-214 YI-ARA is captured arriving at Dubai today devoid of any color except the titles. Is a new livery coming for Iraqi? This entry was posted in Iraqi Airways and tagged 5115, A320, A320200, A320214, Airbus, Airbus A320, Airbus A320200, aviation, Dubai, DXB, Iraqi Airways, transportation, YIARA on January 26, 2013 by Bruce Drum. Iraqi Airways (Baghdad), the national carrier of Iraq, has taken delivery of its first A330-200 becoming a new operator for the type. This will be the first Airbus widebody aircraft to be operated by Iraqi Airways. The carrier already operates two A321 aircraft. A330-202 YI-AQY (msn 1339) was formally handed over on November 30. This aircraft was originally destined for AirAsia X. The airline has been in desperate need of modern aircraft. Accommodating a two-class configuration of 24 business and 264 economy seats, the aircraft is powered by GE CF6-80 engines and will be deployed on European routes including Germany, Austria and the UK. This entry was posted in Iraqi Airways and tagged 1339, A330, A330-200, A330-202, Airbus, Airbus A330, Airbus A330-200, aviation, Iraqi Airways, transportation, YI-AQY on December 4, 2012 by Bruce Drum. Copyright Photo: Pepscl. Please click on photo for full view, information and other photos. Iraqi Airways (Baghdad) yesterday (May 26) was declared bankrupt by the Iraqi Government due to the ongoing debt-related lawsuit with the government of Kuwait concerning the invasion of Kuwait by Iraq under Saddam Hussein. Iraq’s Transportation Minister stated it would take three years to close down the state-owned company. The company may be sold to a private investor which would disconnect the government from the debt. This entry was posted in Iraqi Airways and tagged 21181, 747, 747-200, 747-270C, Boeing, Boeing 747, Iraqi Airways, Orly, ORY, Paris, Pepscl, YI-AGO on May 27, 2010 by Bruce Drum.